We are Jared and Katie, a Kiwi bloke and an American lass. Both wanting more than the “normal lives” we left our respecting countries and moved to South Korea to teach English. We met in the summer of 2010 and have been adventuring all over South Korea on our bikes ever since. Jared is a Kiwi vagabond with an incredible sense of adventure. After graduating University he wanted an overseas experience, so in 2004 he moved to South Korea to teach English where it became his base for his world adventures. 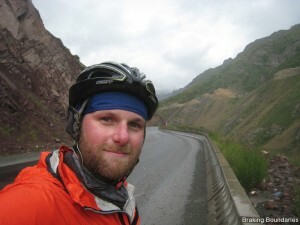 His sense of adventure and athletic spirit led him to buy a bike and explore the country. Very quickly the rides turned into a passion and the idea of a 6-month cycle tour was born. Jared and three of his close friends set off from Seoul, South Korea in April 2009 with a destination of London, England. Six months and 14,000km’s later, they accomplished their goal.